It has been a crazy busy summer. 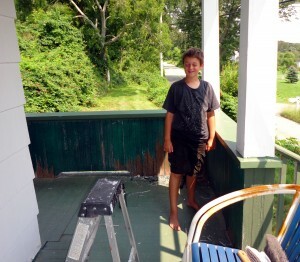 One of the big family projects this summer has been to paint the front porch. Susanna has been doing most of the work on the painting. Her sisters (Sofia and Rebecka) and friend (Linda) helped kick off the project, but I think it turned out to be more work than any of them expected. 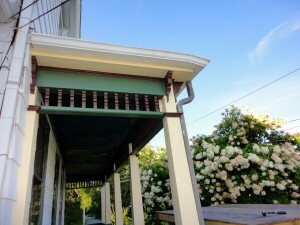 The porch trim had been painted white, with the floor and ceiling (and base of the house) painted green. 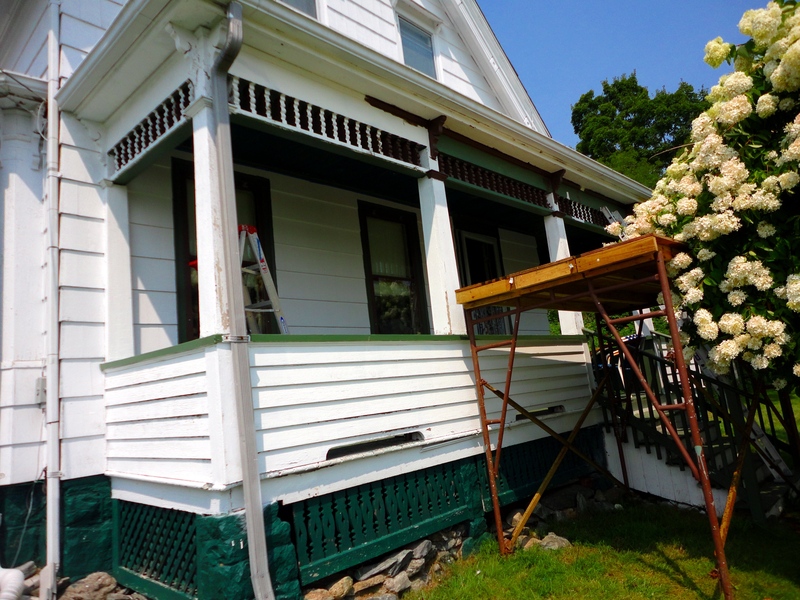 We decided to paint the trim to highlight the Victorian details in the house trim. I picked colors from the Sherwin-Williams historic color collection. The trim color is Rookwood Dark Green, with the accent color being Rookwood Dark Brown. Our plans are to paint the exterior of the house Concord Buff next summer, so the parts of the porch that are going to match the house color are being painted as well. So, for a couple of months the porch will standout from the rest of the house. We have been getting comments about how nice the new paint job is turning out. Several people have stopped while driving or walking by to tell us how much better the house is looking. I can’t wait to see how the house looks when we are finished with all the painting. We still have some work to do on the porch. It has only been painted down to the railings. 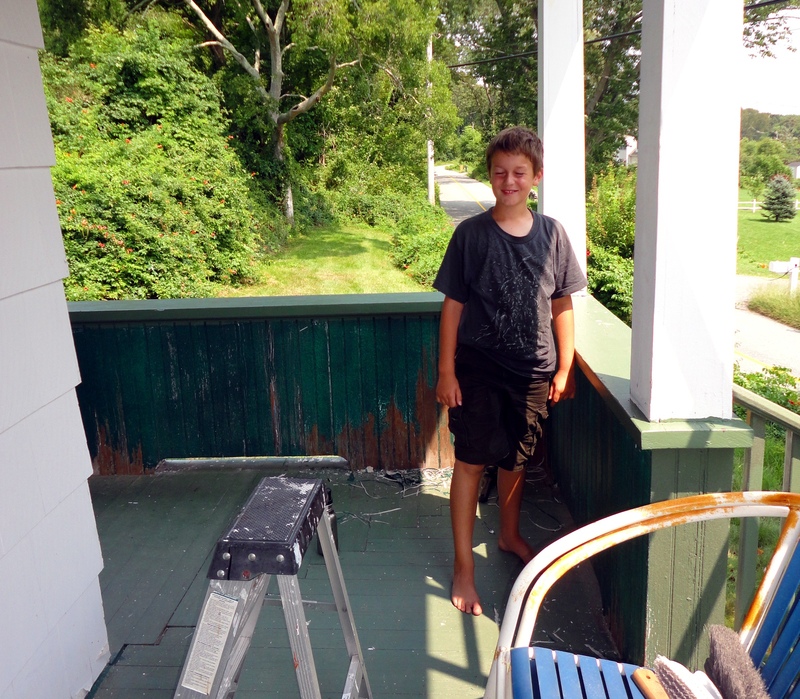 I had talked to Will and Ben, and offered them each money to paint the bottom of the porch. Ben readily agreed. Will didn’t really want to paint, but then he decided he didn’t want Ben to get all the money, and agreed to paint. With all the detail work on the porch, I suspect that painting the porch itself is about 1/2 of the entire house painting effort. We will attempt to finish painting as much of the trim as possible this year, and start with the walls early next year. We have a couple house renovation projects in the wings to be started this winter – with the biggest being renovating the mud room and laundry room (which requires removing a chimney). I have also been making (slow) progress on the sailboat and in the workshop – I’ll write about that later. We also have some big events (personal) planned for next summer, but more on that later as well. Will taking a break from scraping the porch. The walls below the railing will be Concord Buff and the floor will be painted Rookwood Dark Green. 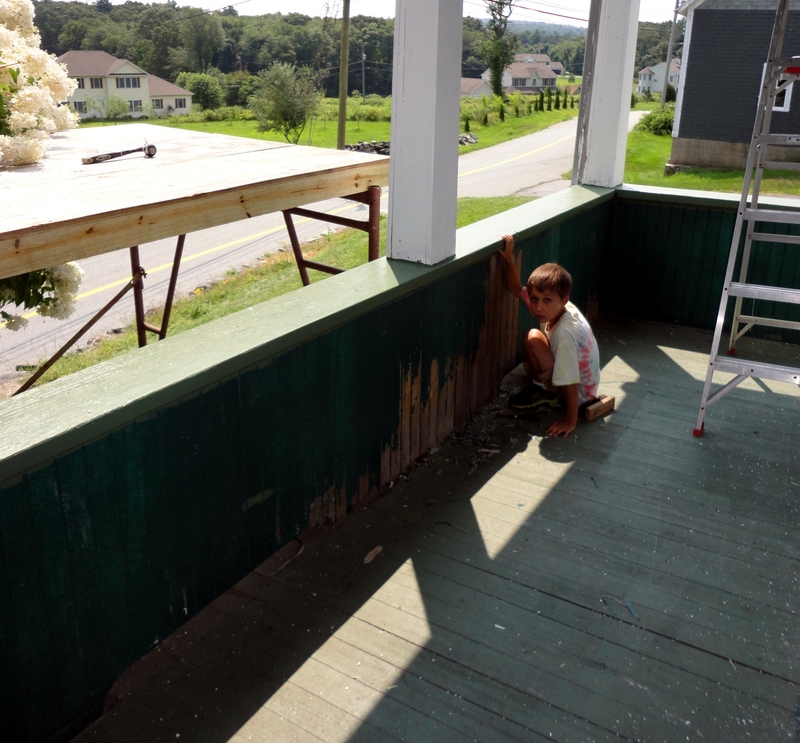 Ben working on scraping the peeling paint from the front porch. After scraping the loose paint off, we will wash the prepared area with TSP and let dry prior to painting.